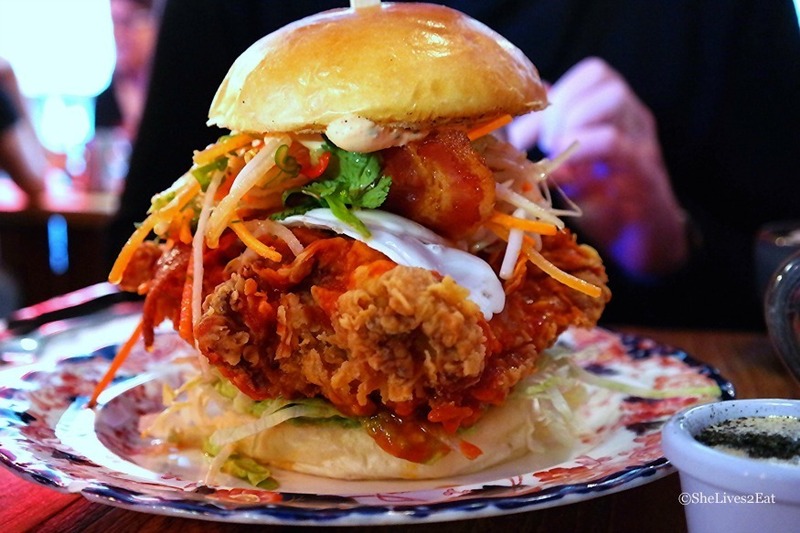 The brunch fried chicken sandwich at Chick 'n' Sours. We should be eating less meat. And if we're going to eat less meat, shouldn't we be making the meat we do eat really count? Make it meat so deeply satisfying you don't need — and probably can't handle — meat three times a day. Make it chicken that deserves to be the star of your lunch, or dinner, or dreams. No more near-plastic processed chicken slices. No more clammy cardboard in a bun. Nothing that, in a blind taste test, you wouldn't be able to identify as meat. Higher welfare, bigger flavours, a reverential approach to fried chicken: this is the good stuff. NB It's always worth asking venues about the sourcing of their chicken. Sometimes you might get a nice surprise (like we did with Foxlow) — and knowing there's customer interest in free-range birds might nudge other fried chicken-mongers toward change. People flocked from far and wide for the Disco Wings at Chick 'n' Sours, when you could only get your hands on some in Hackney. You might not have to flock as far these days, with newer Covent Garden and Islington branches, but the wings are just as good, just as cross-London-to-get-another-hit moreish as ever. Beyond the wings and other chicken orders, the menu's scattered with pickles, chilli and booze — sides and drinks with such big, bright flavours they'd outshine the meat at any lesser fried chicken joint. But this is no lesser fried chicken joint. Chick 'n' Sours, branches in Seven Dials, Islington and Haggerston. Fried chicken and waffles is divisive. Not everybody can get on board with the unholy matrimony of flavours. But we reckon there's probably no sweet, sticky, meaty, carb-heavy version more likely to convince a naysayer than the one at Bird. If you ply somebody with this rich, ridiculous slab of Americana and they're still not into chicken-and-waffles, they never will be. Bird, branches in Shoreditch, Stratford, Islington and Camden. A friend who's recently moved to Zone 4 tells us mournfully that hardest part for him has been no longer being in the Clutch Deliveroo area. And we believe him. If it's your first visit, we strongly recommend the Korean wings, or the sticky heft of the double-thigh burger. But we've never hit a dud yet in our (extensive) roamings around the menu, though cocktails can be on the sweet side. Cooked in groundnut oil, it's apparently healthier for you than your average fried chicken — a healthiness counterbalanced by the fact you'll want to eat your own bodyweight. Clutch, 4 Ravenscroft Street, E2 7QG. Book tickets for Clutch's Boozy Brunch. Butchies is... extra. Everything's soaked in buffalo sauce or swimming in cheese or arranged in foot-high towers of chicken. Butchies is intense, and neon. Butchies is small, and perpetually crammed with people craving that next free-range buffalo wing hit. Butchies is not for everyday, but sweet mother of Jesus, the days you do go to Butchies will be memorable ones. Butchies, 22 Rivington Street, EC2A 3DY. A restaurant here that doesn't brag about its free-range sourcing on the menu or website, but just acts like it's completely standard to be making high-welfare a high priority. It's nice. And same goes for their fried chicken sandwich. Foxlow's portion sizes are always decent, but this one's borderline behemoth. 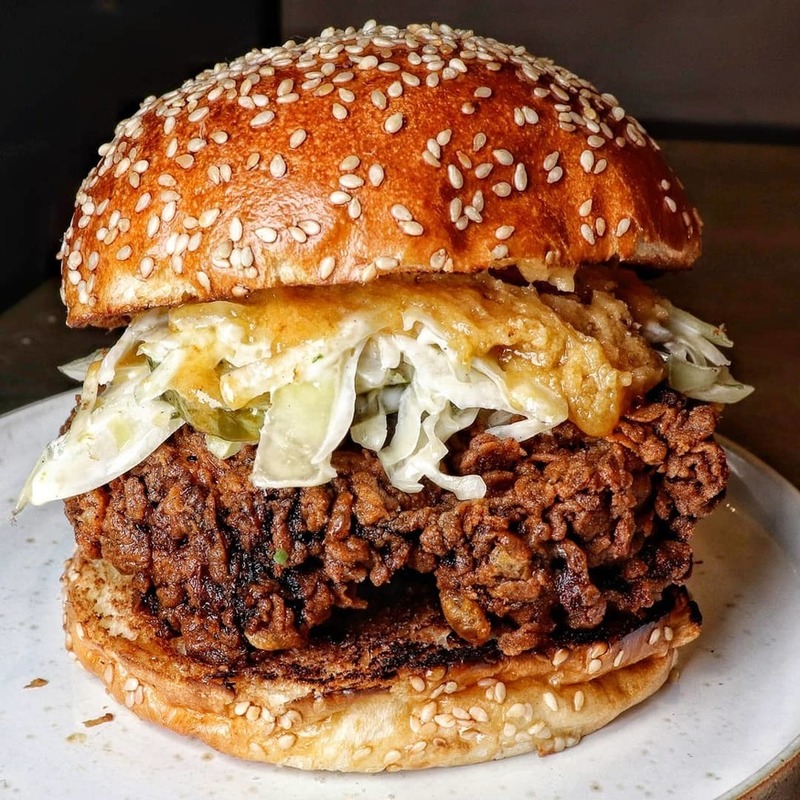 Perfectly crunchy, and topped with kewpie mayonnaise that ups the richness to staggering levels — without, somehow, affecting the crunch — this is a chicken burger at its unfussy-but-decadent best. Foxlow, branches in Soho, Balham and Clerkenwell. A tower of fried chicken. Topped with maple miso butter. Sandwiched with layers of ranch pickles. And the option of extra cheese, if you can really call it an option when there's zero chance you're not going to say yes to it. And the fried chicken batter's been scattered with rice krispies, for extra crunch. Read our review of the burger kings' new restaurant menu here. Burger & Beyond, 147 Shoreditch High Street, E1 6JE.